UU A Way Of Life: Today's lesson - God goes with me wherever I go. 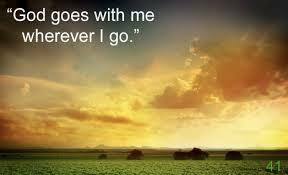 Today's lesson - God goes with me wherever I go. Today's lesson, number 42, from A Course In Miracles, is "God goes with me wherever I go." We have been told that the biggest problem in America today is lonliness. Do you believe that? Why would lonliness be one of the biggest problems in America? What kind of a problem is this: psychological, social, spiritual, all of them? Lonliness, as a problem, at its core, is a problem of the ego. The ego is lonely. It isn't getting enough strokes. When our egos experience lonliness it is because we have forgetten who we are. Unitarian Univeralists covenant together to affirm and promote the inherent worth and dignity of every person. How can a person with inherent worth and dignity ever be lonely? Lonliness makes a person unworthy and undignified. Lonliness and inherent worth and dignity seem to be a contradiction, a paradox. And so, today, just sit quietly and clear your mind of nonsense, of insane thoughts, or what the Buddhist's call "monkey mind." Say to yourself, "God goes with me wherever I go."